The National Dairy Herd Information Association (DHIA) Scholarship Committee selected two college of veterinary medicine students – Sara Davis, University of Minnesota College of Veterinary Medicine, and Jenna Hill, Cornell University College of Veterinary Medicine – as recipients of $1,500 scholarships. Selection committee members evaluated applicants on overall interest as a veterinarian planning to work in dairy, involvement in dairy medicine and extra-curricular activities, and interest in using dairy software and dairy records to aid in dairy management and in improving animal health. To be eligible for a National DHIA veterinary student scholarship, applicants must be third- or fourth-year college of veterinary medicine students, enrolled at a college that is accredited by the American Veterinary Medical Association Council on Education. 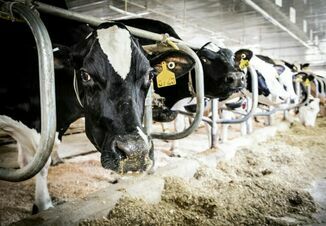 Davis’ devotion to animal agriculture stems from a foundation built on her family’s dairy farm. She started by raising calves, which helped teach self-discipline and attention to detail. At the University of Minnesota, she was accepted into the VetFAST program – an early acceptance program to the College of Veterinary Medicine for those interested in food animal science. As president of the Production Animal Medicine Club, Davis strives to create opportunities for students interested in food animals to help them gain knowledge and skills related to food production animals by hosting meetings with industry professionals, talks with university faculty and wet labs that help students enhance a specific skill, such as conducting ultrasounds. Last summer, Davis completed a Zoetis bovine externship in central Wisconsin. This opportunity improved her palpation, ultrasound pregnancy detection and surgical skills. Davis enjoys consulting work, which blossomed from her participation in the Dairy Challenge. This program introduced her to interpreting records, such as DHIA and DairyComp, and evaluating farms. “When presenting to the producer, the use of data and figures from these records really make a difference to show how they can further improve their operation,” she wrote. Hill grew up on a dairy farm in Upstate New York, where she helped with milking, feeding calves, treating sick animals, calvings and monthly herd health checks. At Houghton College, where she did her undergraduate studies, Hill mentored children in the community and hosted high school science lab experience days. During the high school science days, she guided students in a laboratory environment and taught them basic concepts of biology, chemistry and physics. At the Cornell Teaching Dairy Barn, Hill monitors the herd for heats and breeds eligible cows. Being part of the “Repro Team” taught her how to artificially inseminate cows and enter the relevant data into DairyComp 305. Additionally, Hill schedules milking shifts, updates protocols and standard operating procedures, and serves as a student-faculty liaison. Money generated from the annual National DHIA Scholarship Auction primarily funds the organization’s scholarship program. Investments and donations also help build the fund. To make a donation to the fund, contact Leslie Thoman at 608-848-6455 ext. 108 or lthoman@dhia.org.